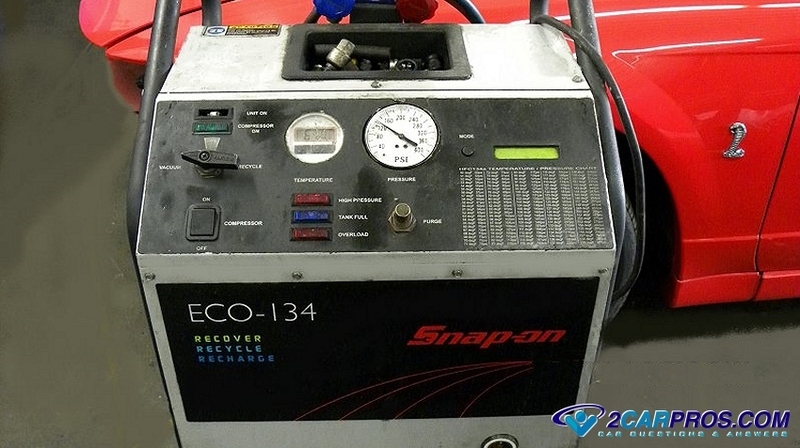 Need to vacuum down and recharge your air conditioner system? We are a team of ASE certified mechanics that have created this guide so you can save money and do the job right. Let's jump right in! Before you begin its good idea to see how the system works. The following process removes damage causing moisture once the system has been opened up to be inspected or after a repair as been performed. If you don't vacuum the system the AC will not be as cold because of the normal air which is trapped inside. Many manufactures recommend the system be vacuumed down each time you service the system to remove residual moisture which helps the compressor last longer. Get the supplies needed to complete this service from Amazon for about $119.00 bucks or the local parts store if you don't have them already. Watch the video below to see how the job is done and then continue reading for tips and information which is updated regularly. Park the vehicle on a level surface with the engine off. 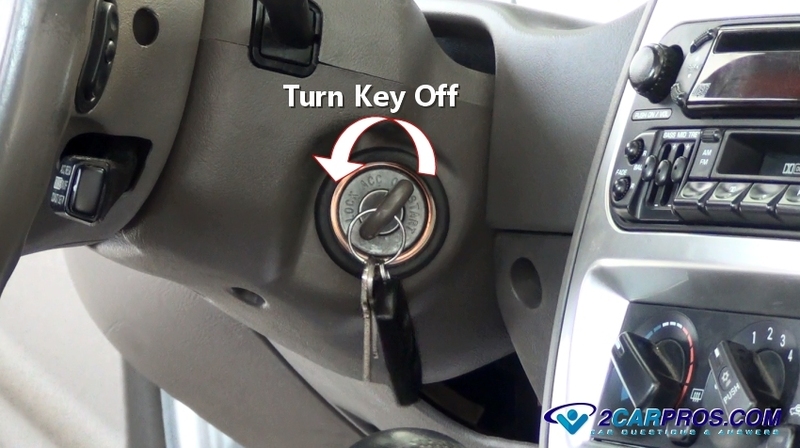 Apply the emergency brake with the transmission in park and wear protective eye wear and gloves. After replacing a failed component the system is "flat" you are now ready to vacuum the system down and recharge it. The high side port should be on the line between the condenser and the expansion valve or orifice tube while the low side port will be on the return line between the evaporator (firewall) and compressor. The high side port is larger in size than the low side. 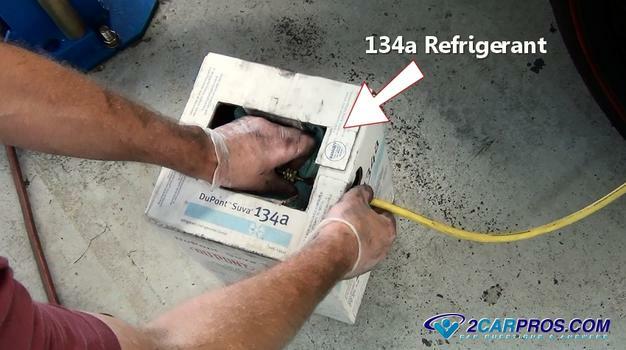 If you are servicing the system or doing repairs that require the removal for the refrigerant continue down to Step 9 of the guide to the refrigerant removal section. 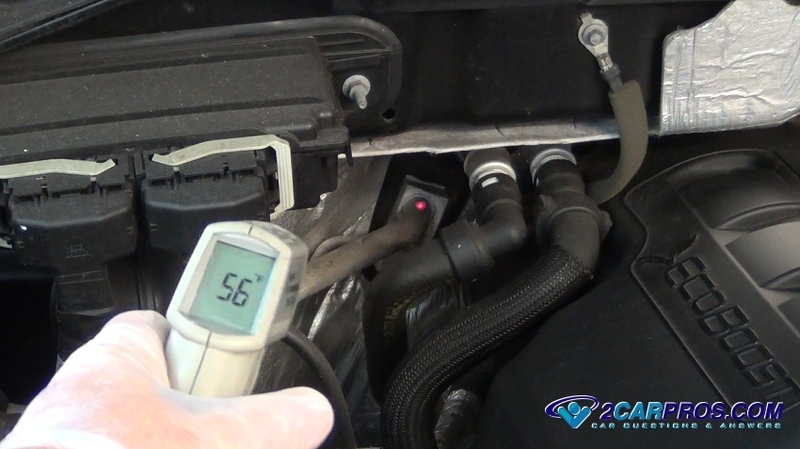 A gauge set is needed to connect to the system on both high and low side pressure ports and it will also be used to vacuum down and recharge the system. 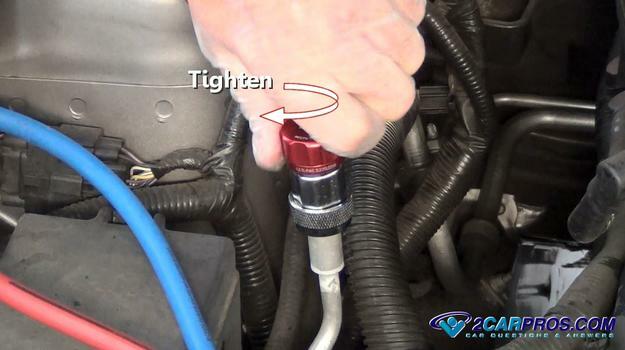 Inspect the connections to make sure they are tight to avoid leakage. These units must be "air tight" and not have any leaks at hose fittings or valves. 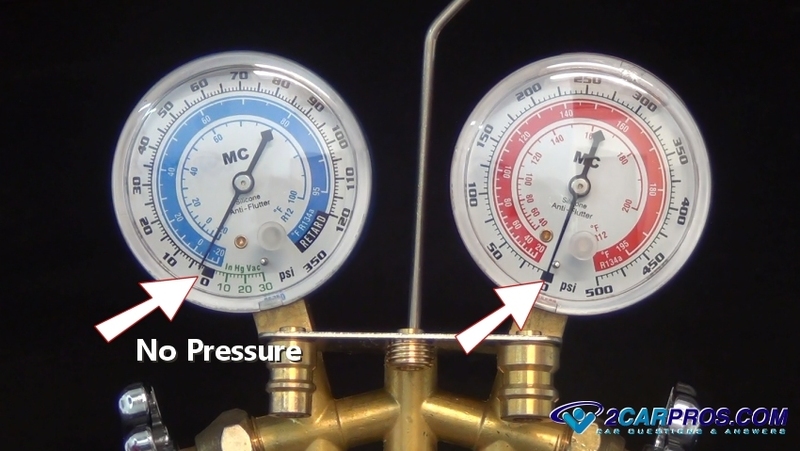 The red colored gauge and connector valve represents the high pressure side of the system while the blue color represents the low pressure side. The center hose (yellow) is connected to the vacuum pump and then the new refrigerant supply bottle or can. 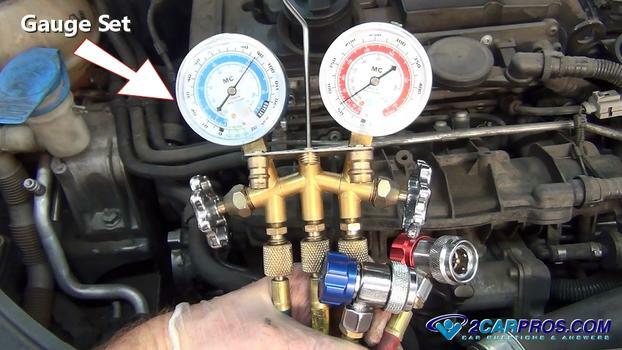 Both gauge valves should be closed before attaching them to the system. 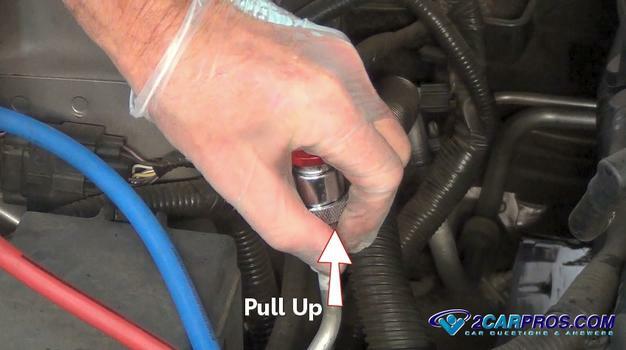 After repairs have been made locate the low side service port on the return hose to the compressor and then connect your gauges to the port by lifting up the connector ring and pushing downward. 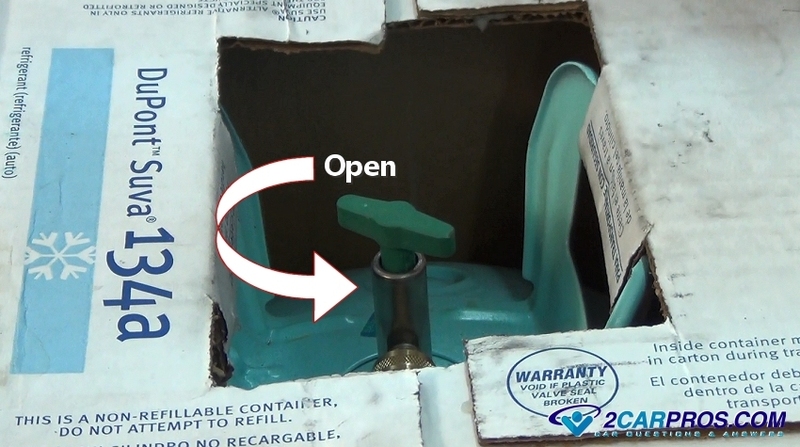 Then turn the valve screw (blue part) inward (clockwise) this will open the service valve below. Repeat this process for both high and low side ports. 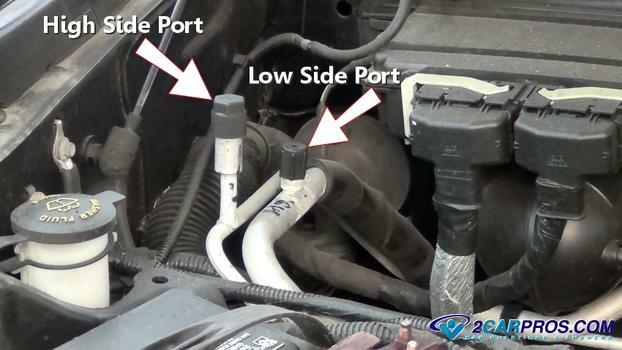 The high and low side fittings will only work on their respective ports due to size constraints to avoid confusion. Once secured tighten the valve which activates the internal plunger that opens the service port valve to the refrigerant lines. Now observe both high and low side gauges with the valves closed there should be little to no pressure in the system. 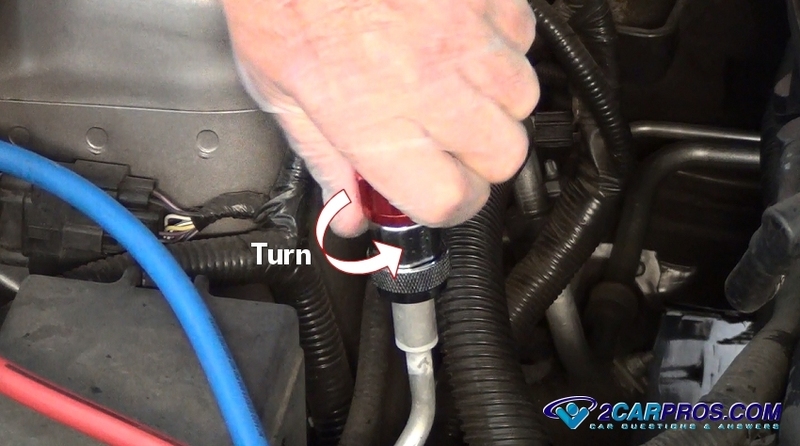 Connect the center hose from the gauge set (yellow) to the vacuum pump and turn the unit on. 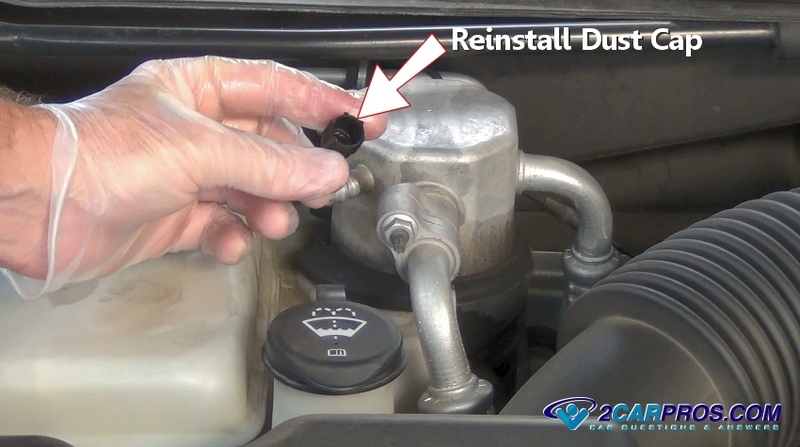 This step is used to remove any moisture and static air from inside the system. 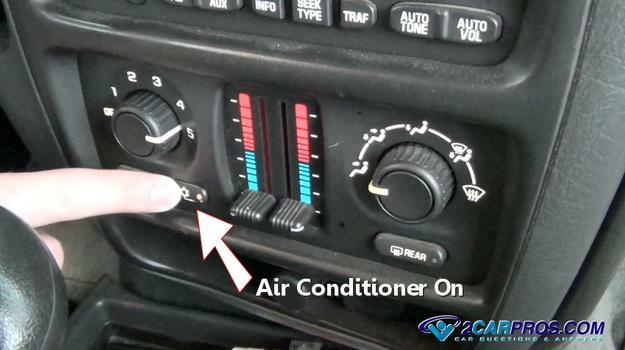 These systems have a mixture of refrigerant and oil to keep the air conditioning compressor lubricated during operation. Measuring the amount of (peg) oil in the system is difficult because it's spread throughout the system, in other words if there is a major leak and oil is dripping out the system will need a small amount of oil. Unlike a very small leak which releases little to no oil you must be the judge of this and add appropriately. Slowly open the low side gauge valve the pump will now start pulling vacuum throughout the system as the gauge needle slowly moves into vacuum. The pump will change in tone once the valve has been opened and it starts to pull air out of the system. Once the vacuum pump has been on for 30 minutes close the low side valve and turn the pump off. The system should hold at 28-29 inches. If the system never reaches 28-29 inches there is a large leak. If the system looses vacuum after the valve is closed there is a small leak and the system must be rechecked. System leaks can include a faulty O ring seal or a loose hose on the valve set. If the system holds vacuum for 15 minutes proceed to the next step. 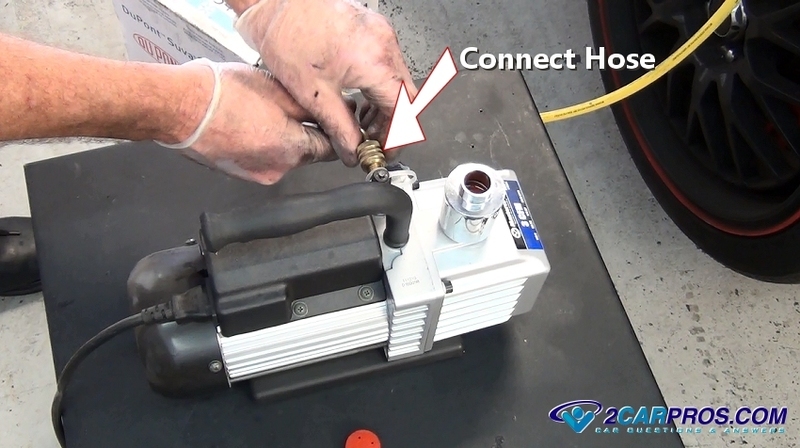 Disconnect the yellow hose from the vacuum pump and attach it to a new r134a refrigerant source which could be a keg (shown) or individual cans which are both available on Amazon or at the local auto parts store. Open the valve on the keg and turn it over to allow the liquid refrigerant to be present at the valve which will charge the system more rapidly. If you are using individual cans connect them to the hose and turn the can over as well. While the gauge valves are still closed and once the refrigerant source has been opened the gauges will respond with an equal readings on both high and low side letting you know that refrigerant is present and ready to be installed. 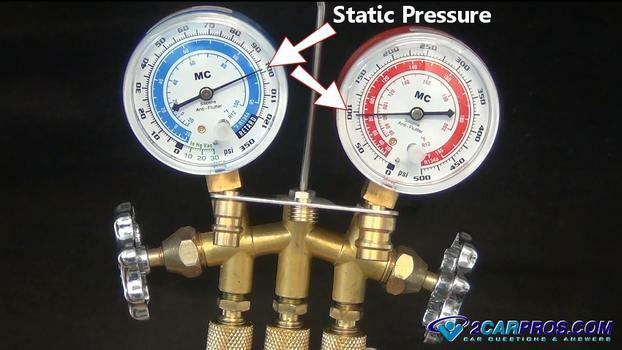 This is static pressure which will vary depending on outside temperature. The warmer the weather the higher the reading will be. This is normal. 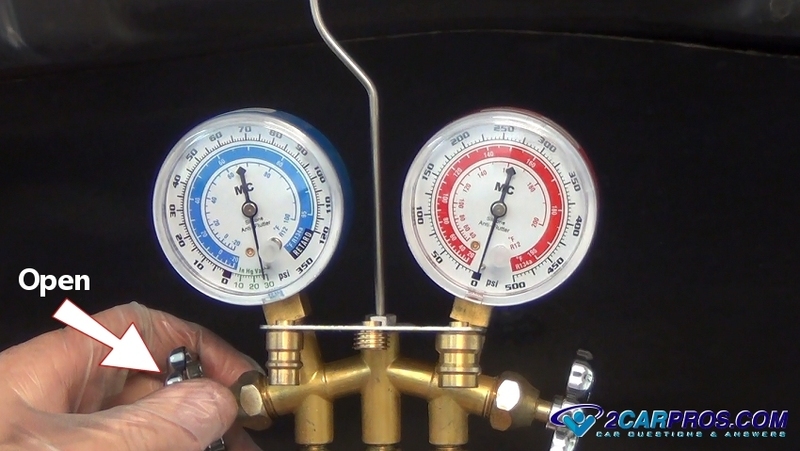 Each system has a specific amount of refrigerant that it needs to operate correctly. This amount is located in the owner's manual or on the system sticker label. If you are using a keg and digital bathroom scale will help tell you how much has been installed. Using the cans make this easier because they say how many onuses are in each can. This guide will successfully recharge the system even if this information is not available. Reference the image below to see how the refrigerant will flow (arrows) once the low side gauge is opened. Never open the high side valve. The high side connection is for monitoring proposes only. Start the engine and turn the system to the highest settings of coldness and fan speed. This will work the system to its fullest which will help you charge the system completely. 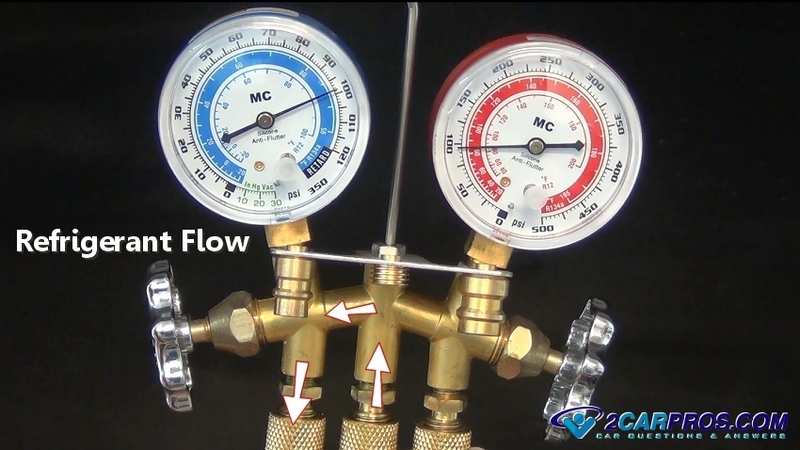 Once the engine is running and the system is switched on slowly open the low side (blue) valve (never open the valve completely) until the refrigerant starts to flow into the system. This will turn the compressor on via the system pressure sensor. 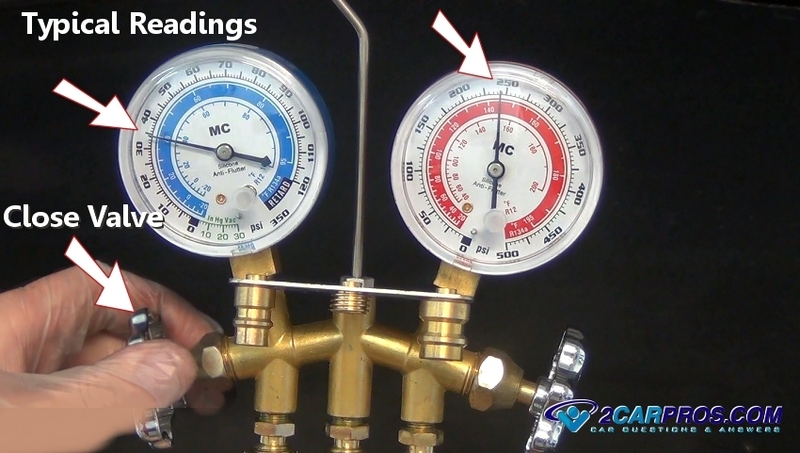 When this happens low the gauge pressure will start to drop and the compressor will cycle on and off as the system low side pressure raises and then lowers, continue to add refrigerant. The high side pressure will steadily start to rise. 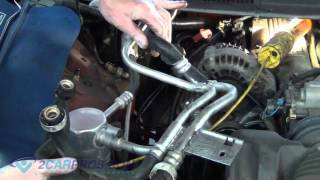 It helps to have a helper raise the engine idle slightly and to use a garden hose to spray water over the condenser at the front of the vehicle to help cool it down. Continue adding r134a until the gauges start to look like this and the compressor stops cycling. 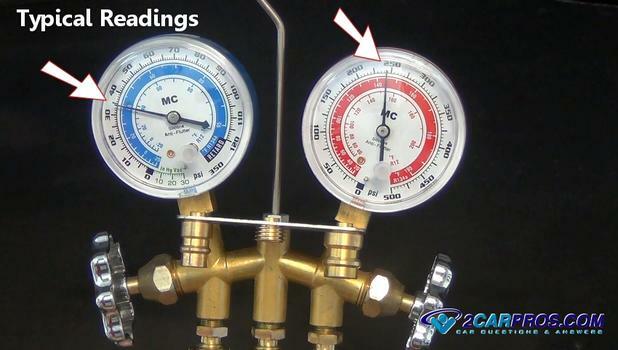 If both gauges are too high the system is overcharged or the cooling fan is not working. 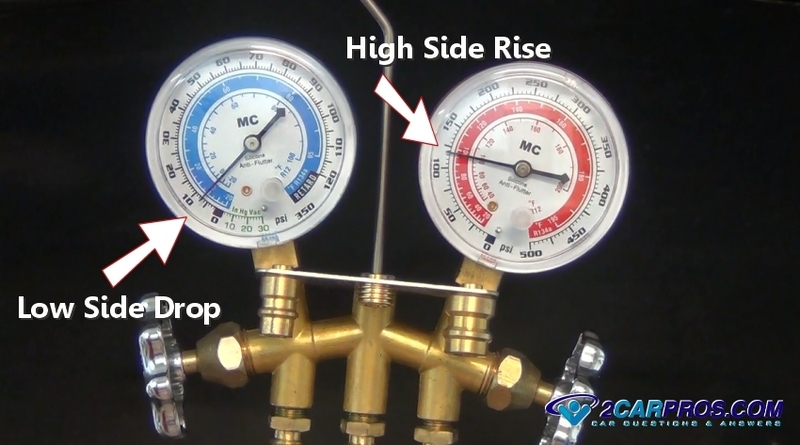 If high side pressure runs way up quickly (300+) and the low side goes into a vacuum the system has blockage such as a plugged expansion valve or orifice tube. If the compressor engages and neither gauge pressures move (stay the same) the compressor has failed and needs replacement. As these pressures rise monitor the temperature of outgoing line of the evaporator and air vents in the passenger compartment. Both should be cold to the touch signaling the system is full. Do not install more refrigerant thinking it will make the system even colder in fact it will do the opposite and make the system warmer as it's unable to achieve the pressure drop needed inside the evaporator. Once the system is performing properly and producing cold air the gauge set is ready to be removed. If the system is not working troubleshooting is needed. After you have completed the charge turn the ignition switch off and the system will shut down along with the engine. With the engine off turn the high side connector counterclockwise to close the internal valve and release the plunger effectively closing the service port, repeat this procedure for both high and low side valves. Firmly grasp the valve retainer and pull up this will release the connector from the service port. 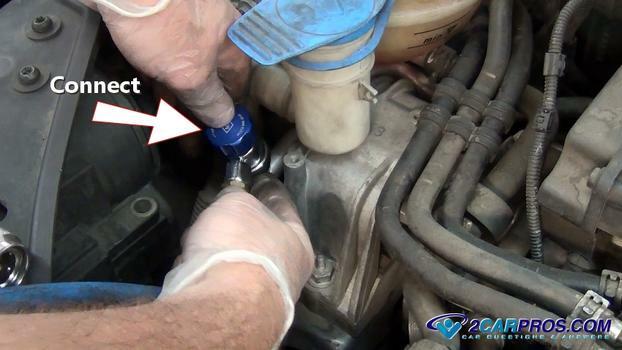 You will get a slight pressure release sound when this is done which is normal, repeat this procedure for both valves. Once both valves have been removed reinstall the dust caps for each service port. Once the job is complete close the refrigerant supply valve and store the gauge set properly for the next repair. Enjoy the cold air! 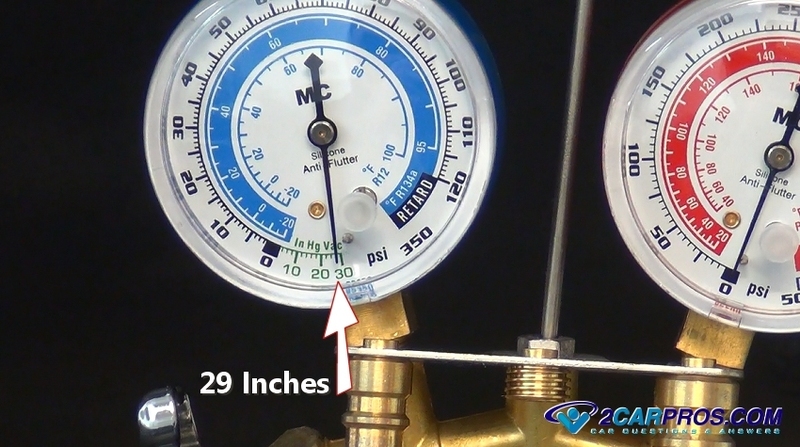 A fully charged system contains refrigerant under pressure (70 to 90 psi static - system not running). If you are performing this service without repairs then the system must be discharged which is done with a recovery machine. Allowing the refrigerant r134a to leak into the atmosphere is illegal though not harmful compared to it's predecessor r12 which was slowly bled out of the system by loosening a hose fitting at the gauge set. This liquid/gas can be recovered if you have a recovery machine which most do not, this machine is mostly found in repair shops. Locate a garage to have the refrigerant recovered before work begins. The recycling machine gathers refrigerant along with a small amount of compressor oil which is then is separated into individual tanks. If you have a question about recharging your air conditioner please visit our forum where hundreds of questions have already been answered by our mechanics. How do I recharge my air conditioner? How do I find an A/C leak? You will also need replacement parts such as a fuse or a relay. We have created a guide that will inform you as to where to go to get the best deal and quality. If you need more information about about this topic please ask one of our mechanics, we are happy to help.